This collection of priceless tips, tricks, skills, and experiences from a veteran of the trade is presented in a way that captures the attention of users and engages them in the process of furthering the art. It includes shop-tested descriptions and illustrations of creative and unique skills and observations from almost 40 years in the metalworking trades. What's more, it offers enough material from several metalworking trades to start a great research and development shop. 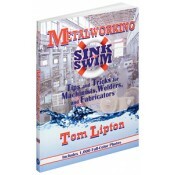 It is sure to be a valuable and time-saving resource for anyone involved in the fabrication of metal.